Artists are Ann Tracy, Julie Sasse and Diane Mansfield Colligan are showing at Triangle L Ranch in Oracle. The Triangle L Ranch was the host for the opening of the show titled “Traces: In Search of Lost Time”. The opening was held on Sunday, Feb, 19, and drew a good and enthusiastic crowd. It is the work of three well known and accomplished artists from Tucson. The artists are Ann Tracy, Julie Sasse and Diane Mansfield Colligan. All three are multi-media artists. 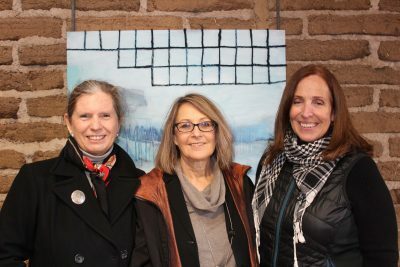 At the showing, Diane’s works are encaustic collage; Ann uses acrylic and fibers in her paintings; and Julie uses mixed media with different materials such as cloth and recycled neckties as well as acrylic on panel to create her art. The show is at the Adobe Barn Gallery and will be there until Saturday, March 11. The closing reception will be held from 1 to 3 p.m. with an artist talk by Ann Tracy and Diane Mansfield Colligan scheduled for 1:30 p.m. For more information contact info@trianglelranch.com.